You can sub-title this post ‘Sharon’s adventures with tofu.’ After 30-coughcoughcough years as a vegetarian, I have finally experimented with the stuff. I’ve never missed meat taste or texture, hence why I don’t go out of my way to buy or eat soya mince, quorn and tofu. I occasionally buy vegetarian sausages, but that’s about as far as it goes. I’m definitely not into recreating meat/fish/eggs dishes with vegan or vegetarian alternatives. Anth, though, is on a mission to do something about my appallingly low protein intake, given I no longer eat cheese. So a few days staying with her gave me some ideas to try. I blame an unfortunate encounter with silken tofu (not my doing, m’lud) for my mistrust of the stuff. So I made sure I bought the firm stuff, with smoked flavour to see if that made any difference. And I drained it properly and also wrapped it in kitchen roll. I didn’t dump the family bible on top of it – on the grounds I don’t have one of those anyway! Tofu does fine in Anth’s delicious Singapore noodles recipe, which I had for Saturday tea. 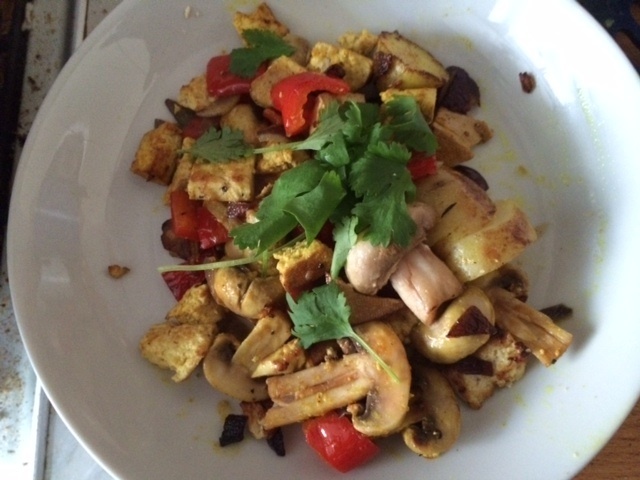 And then I tried scrambled tofu for a Sunday brunch recipe. I poked around online for some inspiration, didn’t much like the look of any of them, so came up with something myself that was edible. Seeing as I have never liked eggs, I wasn’t going to pile it on toast, smothered with tomato ketchup. I did have some potatoes left over from during the week, so fried those and served them with the scrambled tofu. And … It was OK. But I can’t get past that slimy texture. No matter how crispy the outside is, the middle is still meh. I added some other vegetables from the bottom of the fridge, plus a touch of nutritional yeast, which all the recipes online seemed to include. I couldn’t taste it, to be honest. If you like tofu, you’ll no doubt like this. I can report that the fried potatoes were very nice! Gently fry the onion for a couple of minutes, then crumble in the tofu. Add the red pepper and cook for a couple of minutes. Add the mushrooms, turmeric and nutritional yeast and cook for another minute or so. Some of the online recipes included soy sauce, but I’m not hugely struck on that. Season and serve. If you’ve got fresh parsley, add that on top. I had coriander, which was perfect. 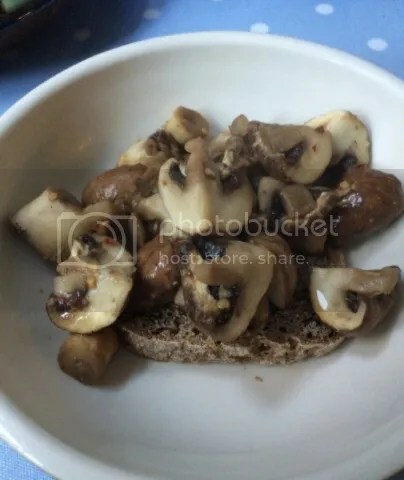 I’m sure the dish would work fine on wholemeal or sourdough toast. Or turn it into brunch like I did with fried potatoes. This recipe deals with two issues at one go. 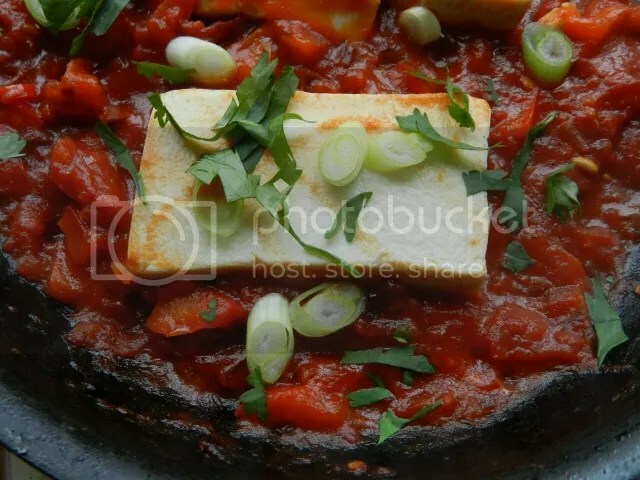 It’s a huevas rancheros recipe for those who don’t want to eat eggs (I’m looking at you, Sharon) and it uses a carton of silken tofu that’s been sitting in my pantry since I bought it over a year ago. This recipe works beyond the expectations I had when I thought it up. If you get organised, marinade the tofu over night, it will definitely increase the flavour. Marinade the tofu in the lime juice for at least half an hour (or overnight for best results!). Soften the onion, garlic, pepper and chilli in a little oil in a small frying pan for about five minutes. Add the tomatoes, oregano and balsamic vinegar and stir until thoroughly mixed. Make two dents in the mixture and place a slice of tofu in each one. Simmer for five minutes until the sauce has reduced past the watery stage and the tofu is heated through. Sprinkle with the spring onion, coriander and serve. Traditionally they should be served on a warmed flour or corn tortilla, but they taste just as good on a couple of slices of toast. A couple of years ago I went to Las Vegas for a sci-fi convention. I had a great time and amongst the highlights were the best margaritas I’d ever had and the best guacamole I’d ever had. It was also the scene of one of the most disappointing breakfasts I’d ever had. Do not have the huevas rancheros at Las Vegas airport. The eggs were OK, but the sauce was underflavoured and watery. Which is a shame because huevas rancheros is one of the great egg dishes of the world. 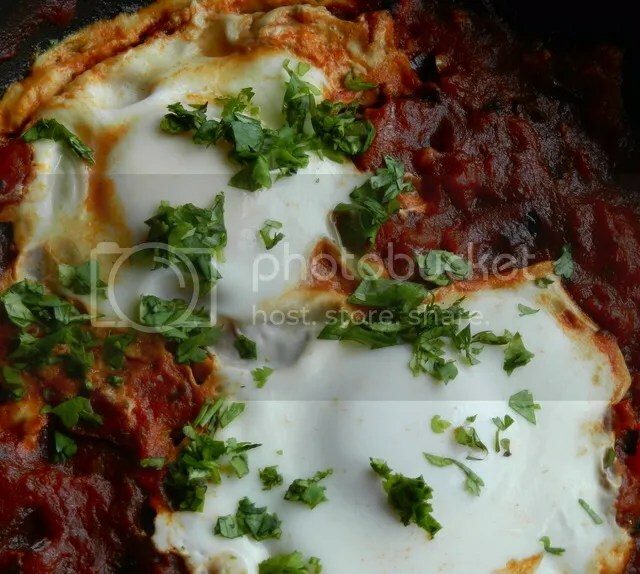 The eggs should ooze their runny yolks into a lovely, tomato sauce with a real kick of chilli. It makes a fabulous weekend breakfast/brunch dish. It is also a great hangover cure (or so I’ve been told). Add the tomatoes, oregano and balsamic vinegar and simmer for another five minutes until the sauce is reduced. You don’t want it dry, but it shouldn’t be watery. Make two dents in the mixture and crack an egg into each of them. Put a saucepan lid over the eggs so that they will cook in the steam. When the eggs are cooked so the yolks are still runny, sprinkle over with the coriander and serve.